This page is a translated version of the page Wikisource and the translation is 79% complete. Wikisource is a Wikimedia project to build a library of free texts. Initially called "Project Sourceberg" when it began in 2003, it branched into subdivisions for individual languages by 2005. Now Wikisource libraries house books, novels, essays, historical documents, poems, letters, speeches and other documents, so long as they can be made available under the CC-BY-SA open content license. The Wikisource Logo changed during the history of the project. 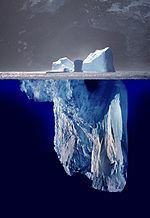 It was originally a .jpg image (as seen to the right), but is now an .svg image of the iceberg (as seen above). An Alemannic Wikisource has been created as separate namespace within Alemannic Wikipedia: Alemannischi Textsammlig (Wikisource) and similarly, the North Frisian Wikipedia has also adopted a Wikisource project in the Text namespace: Nordfriisk Bibleteek. This page was last edited on 15 February 2018, at 16:04.